The mattress brand tulo® recently sent me a free soft queen Bed-in-a-Box Mattress for my honest review. I've thoroughly tested it (and so have a few others in my household), and I'm ready to share my thoughts. 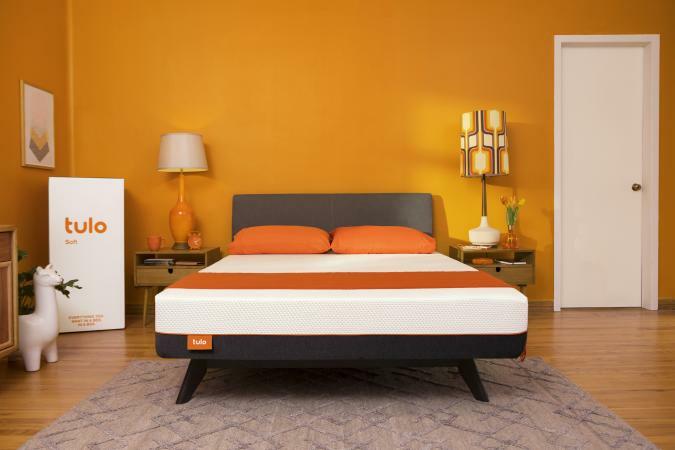 As a brand, tulo® exists in a recently crowded market of mattress manufacturers that ship foam mattresses directly to your home. You can purchase it online, or it's available in brick and mortar stores at Mattress Firm. As mattresses go, it's affordable, ranging from $375 for a twin to $800 for a king or California king. The company also allows you to try the mattress in your home for 120 days and return it for a full refund if you don't like it, something fairly standard among home delivery memory foam mattresses (although many offer only 100 days - so 120 is a little longer to try it out). The mattress is 10 inches thick and has four layers of foam, including memory foam, a breathable comfort layer, a responsive layer to remove pressure, a foundation layer that you can select as either soft, medium, or firm, and a nice knit cover. The mattress also comes in standard sizes twin, twin XL, full, queen, king, and California king. As a side sleeper, I ordered the soft queen mattress. My husband is a side sleeper, as well. My local Mattress Firm delivered the mattresses, which was impressively compressed into a 19"L X 19"W X 42"H box weighing 75 pounds. The delivery gentlemen asked where to put it, and I had them just put the box in my entryway because the room for the bed was in use. After they left, I was able to drag the box up a steep flight of stairs myself, although I did have my husband help me unbox the mattress and put it on the bed because as it expands, it gets rather unwieldly (as does any mattress). Although I required two-person setup, I probably could've done it myself if pressed. I was impressed with the shipping size because another king-sized mattress I had delivered last year came in a much longer, heavier box. One of the issues that often arises with memory foam mattresses is, when you allow them to expand, they give off an unpleasant scent as they off-gas. This one didn't do that; it had no discernable aroma. It also expanded quickly and was usable within an hour or two, although I didn't test it until the next day. I like the look of the mattress. It is sleek, and the cover is attractive; it is gray and white knit that is pleasant to the touch. I like the 10-inch depth because I prefer the appearance of a sleek, low-profile mattress to some of the deep pillow top conventional mattresses. Because of the 10-inch depth, it uses a conventional fitted sheet and doesn't require a deep pocket sheet, something I also appreciate. I test mattresses in various ways to determine whether they work for me, and I like to have others test it, as well. Fortunately, as I tested it over the holidays, I had willing volunteers to give it a try. First and foremost is comfort. I often wind up with sore hips when I sleep, so I was pleasantly surprised to find no aching hips or pressure points on this mattress. I like the firmer feel of a memory foam mattress, and the softness of the support layer was just right for me. My husband felt it was a bit firm, but he prefers the softer feel of a conventional mattress. Memory foam mattresses in general tend to have a firmer feel to them. My son's college roommate also slept on this mattress for a night, and he said that while he often wakes up aches and pains, he didn't on the tulo® and was very comfortable throughout the night. I rate comfort of this mattress as very good to excellent depending on your preference of mattress style. One of the most important tests for me is the bounce test. I discovered early in my marriage when sleeping on an old mattress at my parents' house that when my husband rolled over on certain mattresses, he practically bounced me clean off the bed. Since then, a critical mattress test for us has been to have him roll over vigorously to see if I go flying. I'm happy to report that not only did I remain firmly on the mattress, I barely felt movement at all. It's a great feature of this mattress. I rate it very good to excellent for the bounce test. Memory foam mattresses aren't great with edge support. In other words, if you sit or lie right on the edge, it kind of feels like you'll roll off. The tulo® is standard in this area. If you sleep clinging to the very edge of the mattress, this one probably isn't for you (but neither is any memory foam mattress). It's easily fixable though - sleep a bit further from the edge of the mattress. I rate it fair for edge support. I am a naturally cool sleeper, it's wintertime, and the room where the mattress is tends to stay chilly, so it's difficult for me to determine how cool the tulo® mattress stays in this case. I was comfortable. My son's roommate also didn't notice any issues, and the mattress is engineered for coolness. To know for sure, I'd need to test it in the heat of the summer. I rate it good to very good for temperature control. I like this mattress very much. It's comfortable, attractive, and easy to set up, and I like that it has a trial period. It's also affordable, and delivery is quick and easy. My overall rating is very good and edging towards excellent. I recommend this mattress. Go to bed earlier! We have 90-minute sleep cycles and our REM stage sleep cycle happens earlier in the morning. If you have to wake up early, you may not have enough time to hit the REM stage of sleep before your alarm goes off. Have a regular bedtime routine. Our bodies are on a 24-hour cycle and our bodies do best when we have a consistent circadian rhythm. Train your body so that the appropriate hormones (cortisol/melatonin) get released in response to light/dark. Eliminate distractions. Whether it's using a sound machine to block out other noises, or even wearing a sleeping mask, to keep you from waking up. As a bonus, using pink noise(a gentler version of white noise) has been shown to improve memory in older adults. Complete your sleep system. Choose a mattress that suits your unique sleep needs, such as sleeping position and regulating body temperature. Both are essential to getting quality rest. Avoid using electronic devices close to bedtime. The blue light emanating from them disrupts circadian rhythms. Choose a paperback book or magazine instead. Be aware of what you eat. Avoid eating foods to which you have an intolerance, such as spicy foods or dairy. Tart cherry juice before bed has shown to improve your sleep quality. The tulo® Bed-in-a-Box is definitely worth a try, especially with the 120-day trial period and delivery to your home. I'd recommend it.